Director: Antonio Cuadri, Writer: Marta Rivera de la Cruz, Production Company: Formato Producciones, Spain, 2014 Spanish/Galician, 4×45′, Rights: World. 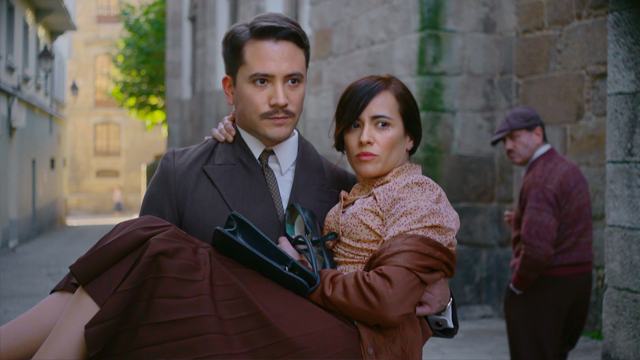 Hotel Almirante is a drama set in Galicia, Spain of the 1950’s. Shot on location in stunning Galicia which gives an amazing atmosphere to this love triangle drama, about love, betrayal, and passion. Hotel Almirante is based on the novel with the same name by Marta Rivera de la Cruz. Hotel Almirante is about Cristina Sanjuan a young women from Madrid, who decide to commit suicide in the room 207 at Hotel Almirante, in the fictitious Ribanova. The girl had never been in the city before, nobody knew her, nobody knows why she committed suicide. She didn’t leave any letter or clue in the room, instead, she sent a letter to the local newspaper explaining the reasons why she took her own life. Cristina had her own reasons to select the scene of his death and the truth is that this could not happen otherwise. Hotel Almirante recreates an exciting and heart-rending love story, as the hotel’s history unfolds, from its founding in the second decade of the 20th century to the post-war years.